The US government announced on 22 January 2018 (local time) that it will impose a 30% safeguard tariff on imported solar photovoltaic (PV) cells and modules. The tariff is based on the recommendations from the US International Trade Commission (ITC) and in accordance with Section 201 of the 1974 Trade Act. EnergyTrend, which has been covering this case, finds that the safeguard tariff will have the most impact on manufacturing operations located in Southeast Asia and South Korea. On the other hand, EnergyTrend also finds that the latest actions taken by the White House are not as severe as the earlier proposals put forth by the ITC. Hence, there is a possibility that the US solar demand will bounce back in 2019. The ITC has released a Fact Sheet detailing the safeguard tariff rates that will be applied to cell and module imports over a four-year period. With the information from the Fact Sheet, EnergyTrend has compiled the following table that summarizes the rates and the exemption quotas from 2018 to 2021. Note:For each year, the first imported solar products that are under the capacity quota of 2,500MW will be excluded from the tariff (i.e. the rate would be 0%). It is still unclear whether the quota covers only cells or both cells and modules. As the table indicates, the tariff rate imposed on cells and modules for this year will be 30%, but it will drop by 5% annually. This solution is similar to one of the three proposed options offered by the ITC in October 2017. The finalized exemption quota of 2,500MW, in particular, is higher than the earlier recommended quota announced last October. On the whole, the terms of the Section 201 remedy that will be enacted by the US government are not as harsh as those suggested by the ITC. ※When will the tariff actually come into effect?Once announced, the measures under Section 201 of the 1974 Trade Act will be carried out with an executive order. The ITC Fact Sheet, however, does not offer a formal schedule that shows the specific years that the tariff will be in effect. ※How will the quota be applied? The ITC Fact Sheet states that the exemption quota is for the first 2,500MW of imported cells only. There is no mention as to whether the quota is for standalone cells or those incorporated into modules. Details on how the quota amount will be distributed are murky as well. ※How will the Section 201 remedy work with antidumping and countervailing duties (AD/CVD) against Chinese and Taiwanese importers? The press release that accompanies the ITC Fact Sheet hints that the safeguard tariff rates may be calculated separately from the AD/CVD rates. If the quota is wholly for the imports of standalone cells, then setting up module assembly lines in the US will be advantageous. If the quota covers both cells and cells assembled into modules, manufacturing operations in Southeast Asia and South Korea will then have to make other strategic adjustments in addition to considering relocating to the US. For example, opening up new markets to maintain exports may be an option. Tsai also noted that there is also the possibility that the amount of solar imports excluded from the safeguard tariff will be determined through future trade negotiations.In terms of domestic cell and module manufacturing, the US still has players such as SunPower Corp. and SolarCity Corp. (which is under Tesla Inc.). There are also US companies such as Hemlock Semiconductor Corp. that supply polysilicon. Much of the Chinese solar production capacity is concentrated on the wafer section of the supply chain. Therefore, further negotiations may open up additional trade channels and perhaps even result in a loosening of import quota. It remains to be seen if the US government is going to pursue extensive bargaining with importing countries so that there will be no problem with meeting the upstream demand from domestic solar companies. Because the Section 201 remedy announced by the White House is less severe than the earlier proposals, there is some room for solar companies to adjust their capacity plans during 2018. It is possible that the US solar market can make a recovery going forward and return to normal in 2019. Tsai pointed out the supply chain as a whole has seen falling prices recently. The continuation of this trend will benefit the downstream market in the US. Prices of mono-Si PERC and multi-Si PERC modules, for example, may drop to US$0.45/W and US$0.42/W, respectively, in 2019. The following figure shows the scale of the US solar market from 2017 to 2021 as outlined by EnergyTrend analyst Rhea Tsao. The figure takes account of forecast analyses on module capacity exempted by the safeguard, possible module capacity expansions in the US, and the downward trend of prices in the solar supply chain. In the figure, the module capacity that is excluded from the safeguard tariff includes manufacturing operations in the US and certain countries (i.e. GSP countries excluding Thailand and Philippines). Solar products that are not based on crystalline silicon (e.g. offerings from First Solar Inc. and Solar Frontier KK) are not targets of the tariff as well. EnergyTrend’s recent survey of customs data indicates that the US currently has a module reserve of around 5-6GW. Therefore, inventory demand for modules in the US is expected to be almost non-existent in 1H18. Later in 2H18, most of the module orders will go to manufacturers unaffected by tariff. While the Section 201 remedy is about addressing the huge market share of Chinese imports in the US, the latest announcement is not expected to have a significant impact on the manufacturing operations located in China. Nevertheless, the US has raised the trade barrier high enough to remove the competitive advantage of cells from China-based manufacturers. Taiwanese solar companies already benefitted from the two latest AD/CVD reviews that were held in December 2017 and January 2018. Their antidumping rate has been lowered to 1.07%, whereas the rate for Chinese solar companies has gone up to 61.61%. Consequently, Taiwanese companies (mainly cell suppliers) stand to gain more with the imposition of the safeguard tariff. Considering all the penalties levied on Chinese imports, US module makers will choose Taiwanese cells with the lower tariff. ※The finalized version of the Section 201 remedy announced on 22 January is less severe than the earlier recommendations, so there is a possibility that the US demand will recover to its usual level in 2019. 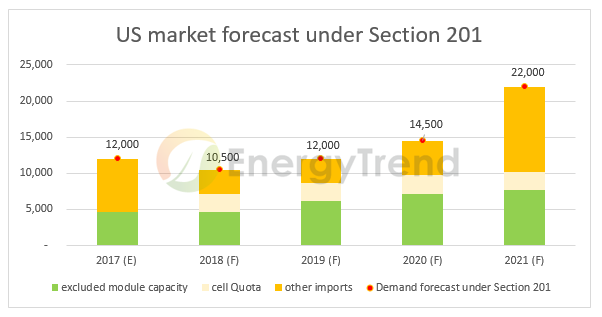 During 2018, however, the safeguard tariff is expected to seriously depress the stock-up demand for crystalline silicon PV products in the US (assuming that tariff will come into effect immediately). ※Manufacturing operations in Southeast Asia and South Korea will be hit the hardest by the safeguard tariff. Producers working there have to first find out how the 2,500MW quota will be distributed and also devise strategies to open up new export channels. ※The safeguard tariff will not have a significant impact on the manufacturing operations in China. Nevertheless, Chinese solar companies that have tried to evade trade barrier by moving production abroad may have to consider setting up factories in the US or expand into other overseas markets. ※Taiwanese cell suppliers have gained from the reductions of the antidumping rate and will again stand to benefit from the safeguard tariff. How much profits they will reap from selling to the US will depend on the local demand.